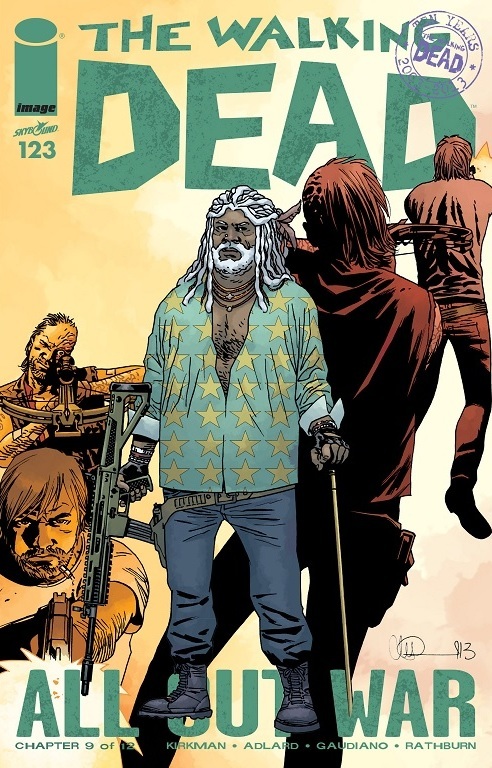 A Look at The Walking Dead- #123: “All Out War,” Part 9 of 12 | What Else is on Now? Part 9 of “All Out War” has Negan set out to make his strike on The Hilltop with the aid of his new weapon: the walkers. So as shown in the last issue, Negan’s strategy is to infect all those who oppose him by having The Saviors muck their weapons. While it sounds like a smart strategy, Negan, as far as I know, never goes about actually testing this to see if it would work. But then, maybe he’s just that confident it will succeed. One thing Kirkman has a habit of doing is never letting the main characters or the audience breathe, and that’s very clear in this chapter. 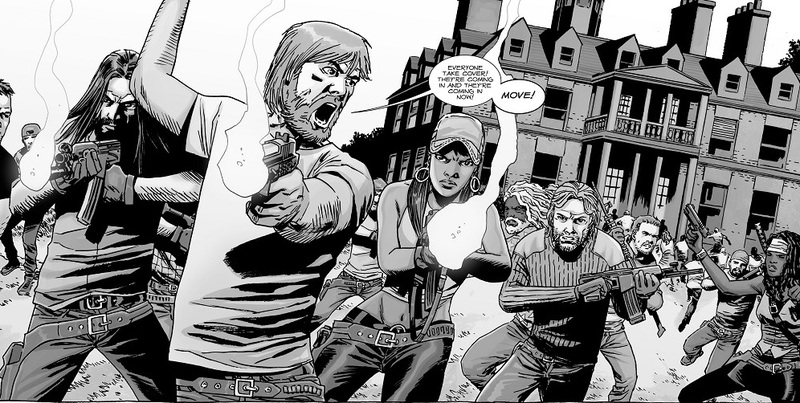 After Rick hoping that Negan would give him at least another day, The Saviors attack at sundown. Speaking of Rick, I did like his moment with Andrea when he expressed genuine optimism that the world they had created wouldn’t be defeated by Negan. Rick’s a smarter man than that, and Andrea knows that, but despite everything Rick has been through so far, he still manages to have a glimmer of hope in the face of impending danger. 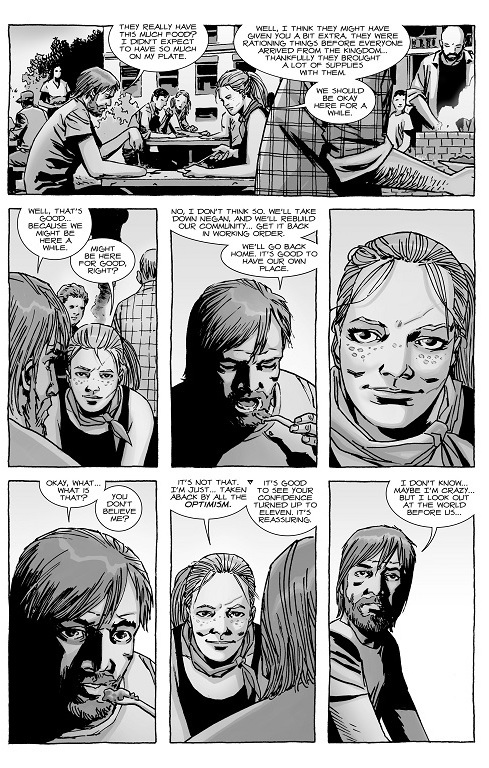 But this character moment, like the brief exchange between Carl and Sophia, or Maggie and Andrea’s conversation about the future, only served as a temporary opportunity for the characters to calm down for a second and relax. 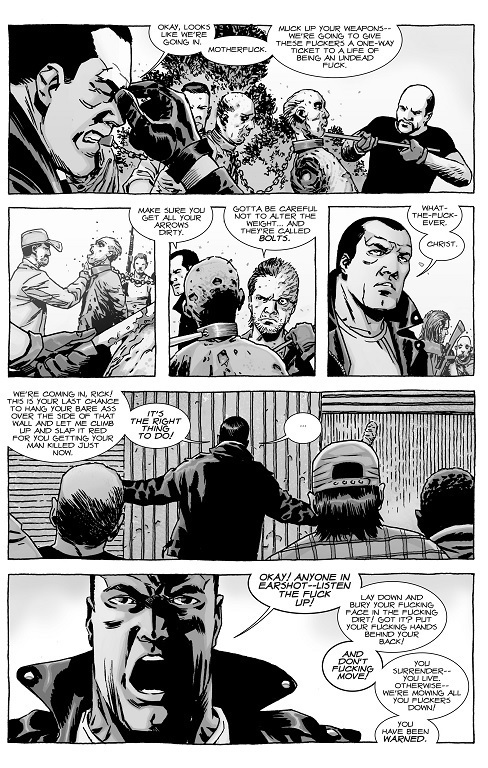 They were brief enough that allowed readers to get the gist of it before getting a face full of Negan’s fury. And never let it be said that Negan is a patient man- he just isn’t. And how casually he orders one of his men to shoot Kal on the grounds that he wasn’t Rick just shows how much power the man possesses. Sure, the Governor was a force, but I see Negan as more like an unchained mad dog. He’s already pissed off, but if you let him go, he’s going to kill. At least he’s not lobbing grenades all over the place again. Not now, anyway. The chapter ends mid-battle with Rick’s fate up in the air. Again, since Negan never tested this new experiment of his, and given how he doesn’t know about what Dwight’s been up to, I doubt Rick would go out like this. But good cliffhanger to end on. As for Rick’s sudden optimism, it’s very foreboding, for we know that in this world, things can go from tranquil to solemn in an instant. This entry was posted in The Walking Dead and tagged Andrea, Carl Grimes, Dr. Eugene Porter, Dwight, Maggie Greene, Michonne, Negan, Rick Grimes, The Hilltop, The Sanctuary, The Saviors, The Walking Dead by omarid513. Bookmark the permalink.